"Essentially, we're programming oxygen and then having the fire follow it around the environment," Arne Meyer of Naughty Dog told Europe's PlayStation.Blog. 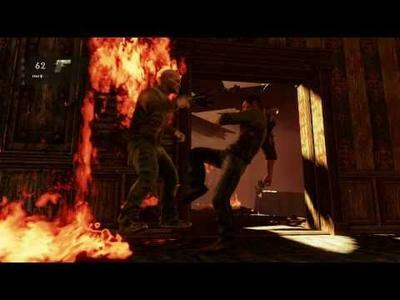 The developer describes procedural fire as one of the toughest things to cram into a Uncharted 3, and yet it was right in the foreground of the premiere gameplay footage that aired on Jimmy Falon's late show so long ago. Since that premiere, Naughty Dog has posted several direct feed clips of the battle in the burning chateau. You can catch the one that features fire heavily above. Naughty Dog has a penchant for challenging themselves in the arena of environmental effects. Water dripped off of Drake in the original, snow caked and crumpled around his clothing in the sequel and now the third entry sports unique sand and fire physics. The studio, as they have claimed in the past, is all about challenging themselves. According to Co-President Evan Wells, "We're a bunch of nerds. We just look for something that will be a technical, artistic challenge, and allowed us to push into an area of the world and history we've never tapped into before." We're always on the lookout for new technical challenges and we're really happy with what we're achieving with our fire effects. It's not just a static asset – the fire deteriorates the wood realistically and there are blowback effects, like you would expect. The smoke is looking much better this time around. You could sit down and watch the chateau burn around you, if you sit there long enough; however, we want the player to proceed through the game at a decent pace so that's not going to happen. Even in this demo, you can see beams deteriorating as they burn, and you can even take cover behind them when they give way and fall to the floor, only for that cover to disappear when the beam has burned away completely. Procedural fire is a pretty difficult technical challenge, especially on top of everything else you're trying to get in the game, but it produces some brilliant effects, like the corners of the wallpaper starting to roll and then igniting, and then the embers flickering in the air. Essentially, we're programming oxygen and then having the fire follow it around the environment. 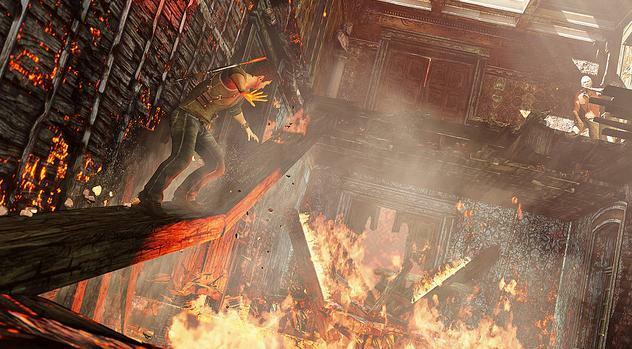 Uncharted 3 is set to release later this year for the PS3. The title will follow a sequel that rightfully garnered immense amounts of critical and commercial success, one has to wonder what sort of pressure that's putting on the game's developer, Naughty Dog.